Some time last year, on some food show, someone was eating anchovy pasta. (If I were to guess, it was an Anthony Bourdain episode somewhere in Italy.) Anyways, so I made an attempt at anchovy pasta last year (plus meat balls & veggies to dilute the carbohydrate overload.) I was very surprised when N requested this dish a couple of months ago. 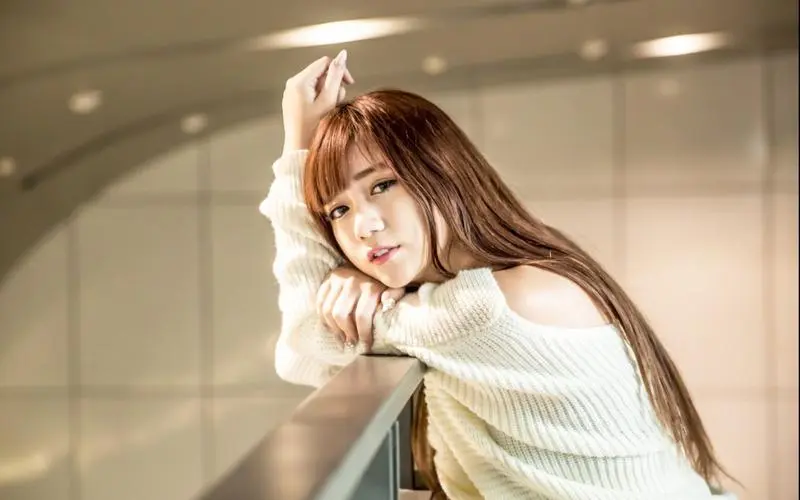 I liked it, but did not think others would. There are many recipes for anchovy pasta on the Internets. I used a simple recipe - sauteed onion and garlic, added red pepper flakes, and lots of anchovies (I could have added more.). Used a spatula and break up the little fishes. Then tossed in spaghetti and sprinkled with toasted breadcrumb, PARM, and parsley. Although I suspect the anchovies available at the common supermarket is not as good quality as I need. I will send a search party for better ones next time. Even though I wanted to make meat balls, I was behind in my holiday tasks - I had to send our letters. Limited by time, I was thinking an antipasto of some sort. But G was insistent about meat balls. So we had store-bought meat balls with brown gravy. Sigh. Some things I just gave up on arguing. I was absolutely shocked at the amount of pasta I made. N was right when he asked, 'Are you new?" Ha! I am a total rookie. 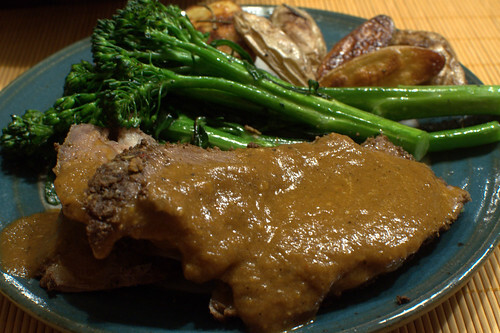 Not to mention I have got to get myself a gravy boat, even if to serve brown gravy from a packet. Ahem. After dinner, we selected Settlers of Catan (again!). After last week's arguments about the rules , I was wonder who will be the grumpiest this week? Heh. I was terrible in reciting the rules. I need to grab the English rules and distribute. Hopefully that will reduce the arguing. There was a lot of mad faces, in addition to the trash talks. I would not have guess a build-things game would be so contentious. I was very boxed in on this board - relegated to 12, 2, and near the desert were not good positions. Even though I did not come out ahead on this time, I still like this oldie goodie. About a year ago, N and I wanted to order a half goat from Thundering Hooves. By the time we were in a position to do so, they were out, so we waited. Last month they finally became available again, so we jumped on it and ordered a half goat. 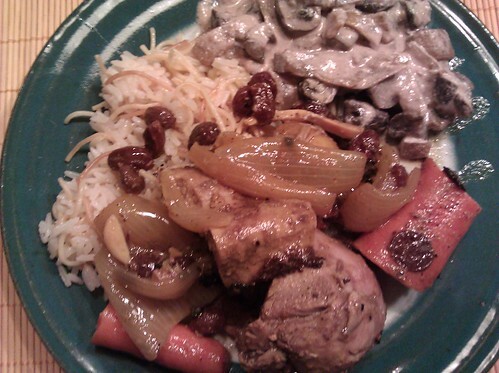 N and I like goat -- similar to lamb with a bit more gaminess to it. I've never cooked goat but N has. We eventually decided on a sort of goat leg stew with a lot of sumac. N marinated it for a few hours and then seared it in a cast iron skillet. Afterwards he tossed it in the french oven with some potatoes I grew, a huge yellow onion from the farm share, raisins (your favorite), and carrots. 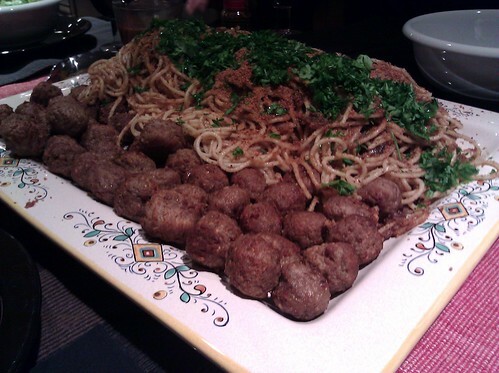 We also had vermicelli rice, a sort of mushroom stroganoff, and the ubiquitous salad. Afterwards we played On the Underground and followed that up with a couple of rounds of the bean game. Ahhh, game of contention. I am not sure what was going around the table on Saturday, but I think with the exception of you, we were all rather grumpy and we played a rather contentious game of On the Underground (BGG). 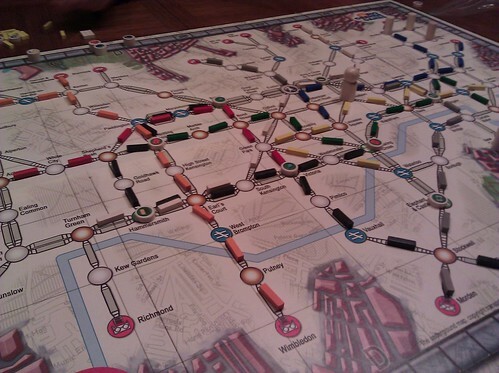 The last time we played On the Underground, we misunderstood some directions and I clarified them by re-checking the forums on Board Game Geek. This time we played it ... well, closer to correct! I'm not sure if it was more fun or not though. It still took us a lot longer to play than the game says. Maybe we're just slow! 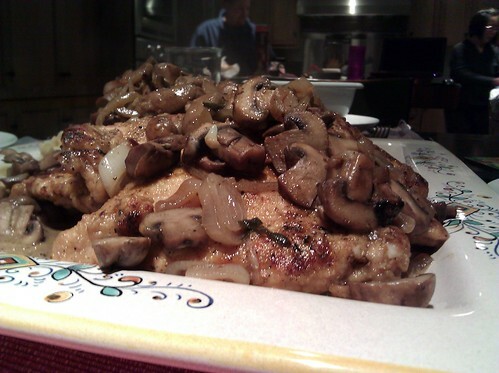 Hi J - I am so glad you and N enjoyed this dish! So there is this restaurant, Original Joe's, that I loved to go to when I was in school (when I can splurge!). I used to get their Chicken Sec. It is an awesome old school place, with waiters in tux, neon & plastic decoration, and very tasty food. This dish is nowhere as tasty as Chicken Sec. However, it is as comforting as can be, in the middle of a marathon few weeks at work. (recipe modified from epicurious). After a spongey dinner, we managed a game of Settlers of Catan. Yay! It has been many years since we played. I still dislike the English art immensely. 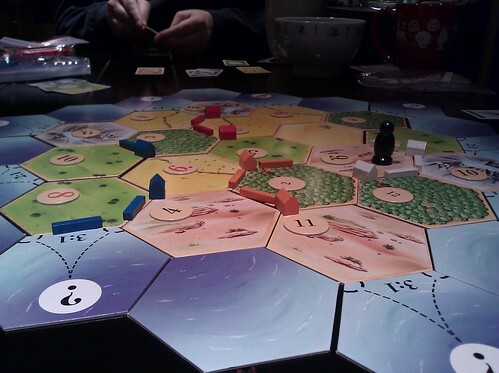 I have since taken that copy to work to loan to someone who has never played Settlers. 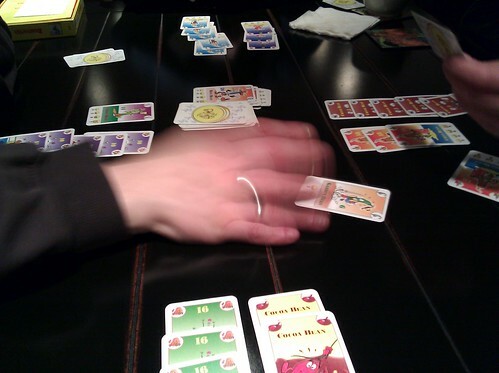 But of course, we ended the evening with the Bean game. Please excuse my delay! We had this dinner the first Saturday in November. I'm a month late! Even though we have approximately 100 times as much freezer space as you, we still end up with too many things in the freezer. I went digging through the freezer in an effort to clear out some meat and found a pot roast from Thundering Hooves. I'm not entirely sure why I bought a HUGE, 4 plus pounds pot roast. We never make pot roast. In fact, I don't think I've ever cooked a pot roast (until this day). N and I did some recipe searching and decided we'd give it a try. We started with Alton Brown's Pot Roast recipe. The problem was -- it has olives and raisins in it. In an effort to make it something you would actually eat, we conferred with a food scientist (hee) and subbed in carrots for the raisins (for sweetness) and some roasted pepper tapenade for the olives. We also used spicy V8 for the tomato juice (since that was what we had). We cooked the pot roast at about 200°F for over 8 hours -- which wasn't quite enough time to break down all of the connective tissues, in my opinion (but it should have been). The final gravy-sauce-thing was ok, but sort of reminded me of fajitas in a not-so-good way. I did like the bit of tang the vinegar added though. I think the reality is ... I don't like pot roast unless it's cold! 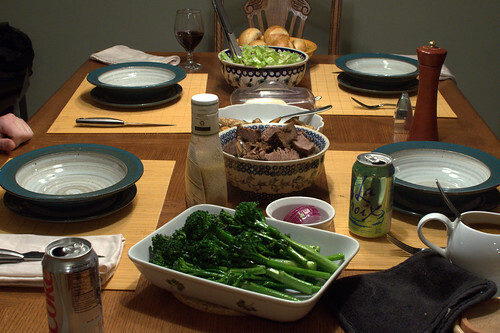 We had a salad, store-bought sourdough rolls, roasted rosemary fingerling potatoes and broccolini with the pot roast. All of that stuff was tasty! I'm no longer sure what games we played. Boo on me for taking too long to share.